For discreet emergency lighting that's cost-efficient and eco-friendly look no further than our LED emergency downlights. LED emergency lighting is a popular choice for businesses and organisations that want to reduce their long-term energy costs and introduce an energy-efficient, environmentally-friendly emergency lighting solution. With improvements in manufacturing and distribution LED emergency lights can be sourced very cost-effectively allowing more people to take advantage of this great technology. LED downlights are slimline in design and fit into ceiling recesses so unless they're switched on you're unlikely to even notice they're there! 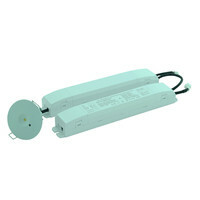 These emergency lights are light, compact and easy to install, reducing the time it takes to introduce a reliable emergency light system on your premises. Furthermore they have a lifetime of over 50,000 hours which means less man-hours and costs replacing used bulbs. Our LED emergency downlight range includes a Self Test LED Emergency Down Light available in both maintained and non-maintained versions. This self test emergency downlight will automatically run an LED performance test monthly and a full function test annually, helping to increase the cost-effectiveness of this type of emergency lighting. We also stock the Glade 1W white Non-Maintained Emergency Downlight which will illuminate the area for at least 3 hours in an emergency as well as the Glade 5W White Maintained Emergency Downlight which is ideal for areas with high ceilings. 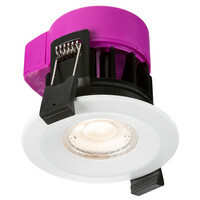 If you need any assistance choosing an LED emergency downlight please call our team on 01792 452 700. Loop in/loop out push-fit terminals. Complete with interchangeable white bezel. 30, 60 and 90 minutes fire-rated. 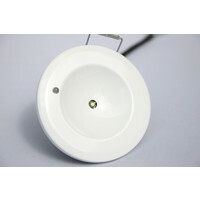 In an emergency this non-maintained LED emergency downlight will illuminate the area for at least 3 hours. 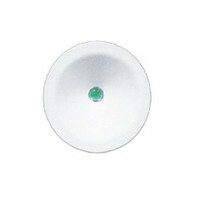 The Glade maintained emergency downlight with a light output of 194 Lumens is ideal for areas with high-ceilings. The 1W Self Test LED Emergency Down Light is a low-energy, low-cost alternative to traditional emergency lighting with self-testing functions.